Pizza Hut and Toyota have teamed up to bring fresh, piping hot pizza to your doorstep with the help of a roaming pizza machine. 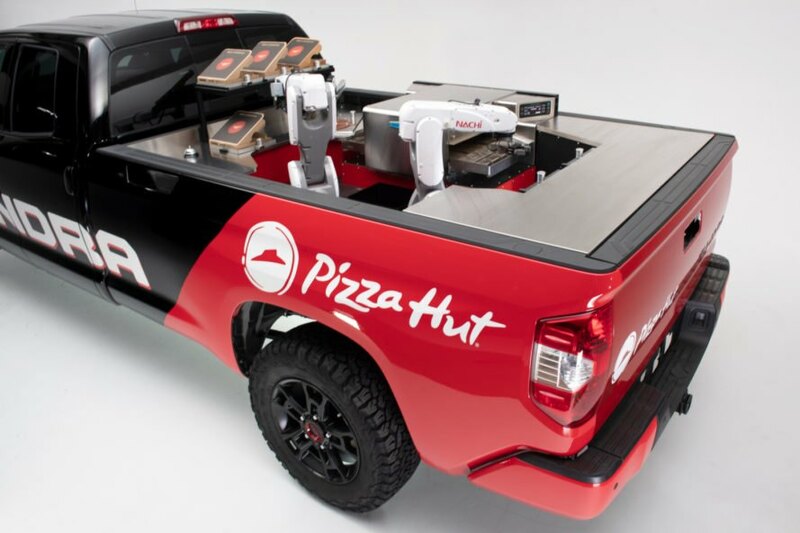 The Toyota Tundra PIE Pro is a full-size pickup truck with a complete pizza making factory in the back that is entirely operated by computer-guided robotic arms. Not only does the next generation of pizza delivery get the pizzas made and delivered in the blink of an eye, but the delivery trucks are also zero emissions. The incredible design, which was unveiled at Toyota’s 2018 Specialty Equipment Market Association (SEMA) Show, is a truly unique invention. Although we’ve seen plenty of ingenious food trucks, the Tundra Pie Pro is quite possibly the future of pizza delivery. The custom-made truck is installed with a unique truck bed that has been converted into an open-air kitchen. When a pizza order is placed, a pair of computer-guided robotic arms open the refrigerator and remove the selected pizza. The arms then place the pies on a conveyor belt that passes under a high-speed, ventless oven. Once cooked to perfection, a second arm removes the pizza and places it on a cutting board, where it then cuts it into six identical slices. The arms even put the pizza into a box and off it goes to the customer. The entire process, from start to finish, takes up to seven minutes. Although the objective was to create a faster delivery system, the Pizza Hut and Toyota team were also focused on creating an eco-friendly vehicle. The team took the conventional gasoline-powered drivetrain of the Tundra out and replaced it with a hydrogen fuel-cell electric power unit to make the truck, as well as all of the kitchen components, emissions-free. Pizza Hut's zero-emissions mobile pizza factory makes pizzas on the back of a truck bed. Tundra PIE Pro is equipped with a hydrogen fuel-cell electric power unit to make it emissions-free. The design could completely change the future of food delivery.